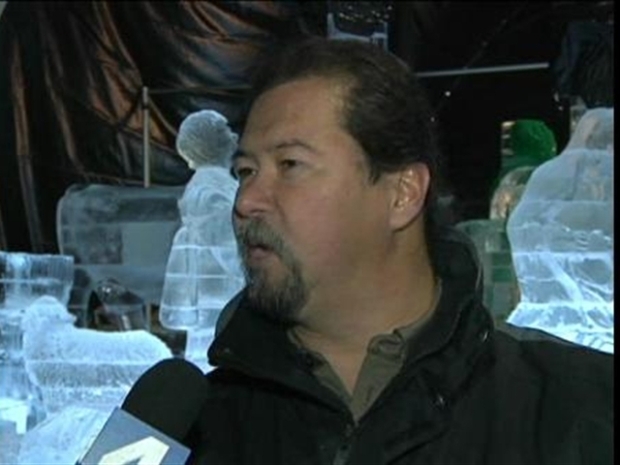 Chinese Sculptors Put National Harbor on ICE! Looking for something cool to do this holiday weekend? Get on up to the National Harbor for a real icy treat. The Gaylord National Resort and Convention Center has enlisted forty Chinese artisans armed with century-old tools to hand carve 2 million pounds of ice into 10 scenes for an exhibit called ICE! "They’re raised from a very young age, around 5 or so, to learn the carving and they hone their skills," ICE! Associate Producer Terry Barnett said about the sculptors. "They have a festival every year that they carve a large city with hotel-sized carvings, animals all different types of carvings and creations." The sculptors need a month to transform the ice into the displays, which range from nativity scenes to D.C. monuments and include designs that appeared in the past at other Gaylord resorts. The pièce de résistance is an ice castle complete with four ice slides made for children of all ages. A breath-taking exhibit opening next week at National Harbor will change the way you look at ice. "Unless you have traveled to Harbin, China, this is amazing," said Amie Gorrell, of Gaylord National Hotel. "People walk in and they're wide-eyed and they're just astounded at the art that we are able to achieve here -- all created in ice." The exhibit's temperature is 9 degrees, and while the Gaylord will provide jackets to guests, they are encouraged to dress for the cold. "It is very cold, and we do encourage folks to bring a hat, scarf, gloves," Gorrell said. "Do dress warmly. The parka is going to keep you warm, but if you really want to enjoy it to the fullest extent, please dress warmly." ICE! opened Nov. 19 and runs until Jan. 10. Tickets cost $13 for children ages 4 to 12 and $24.50 for adults.